The Unbeatable Squirrel Girl #32 review: A new era and answers to many questions – AiPT! We will miss you, Erika, but, if this issue is any indication, Squirrel Girl is in the right hands. Paws. Whatever. There is always an adjustment period when an artist changes on a comic, especially when the previous artist has a unique style. Some comics ignore the change, some embrace it. Squirrel Girl tweets about it. Known artist of adorable things, Derek Charm, has taken the pencils of The Unbeatable Squirrel Girl from the iconic Erika Henderson. With writer Ryan North still on board, there is consistency, but, of course, there is change. While I won’t say that it’s for the better, as I have adored Henderson’s work on USG, I will say that Charm’s cartoony style works very, very well with Doreen and Friends, and he has set himself apart positively and immediately from his predecessor. The best examples of this are Kraven’s airbrushed van (the Kra-van) and the ¾ page reveal that Squirrel Girl is, in fact, the mild-mannered computer scientist, Doreen Green! FYI: Kraven is not surprised by this in any way. While Doreen, Nancy, and the crew trying to hang out with villains in an attempt to make them forget about crime by doing an Escape Room is a hilariously Squirrel Girl-esque concept, it belies a new approach to the series. Doreen is branching out, working to better students at the local high school by working as the sponsor of a computer science club, while also doing her super-heroine duty by working to reform baddies. 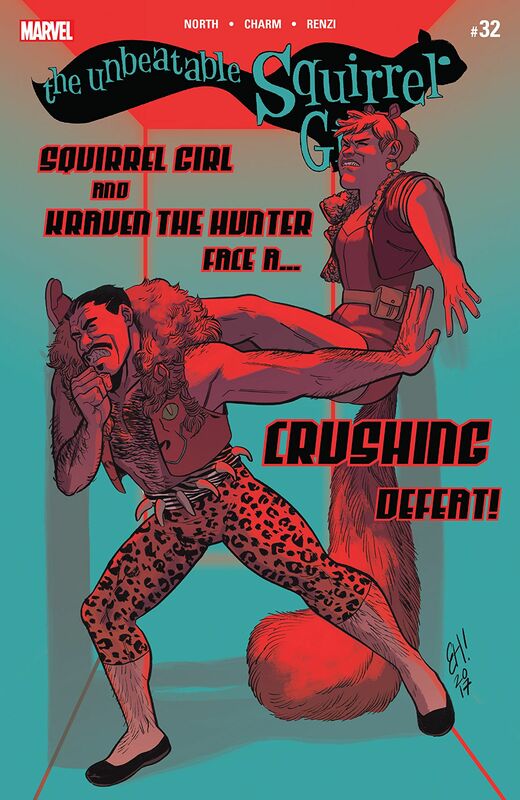 Squirrel Girl has long had positive relationships with some unsavory people, and Kraven the Hunter is no different. Having met Squirrel Girl and Nancy on their previous trip to the Savage Lands, they have a positive relationship with the dreaded hunter of spidery men. Two things in particular stand out in this issue. The first is the ease at which Charm’s art fits in with North’s writing (and the Squirrel Girl ethos) in such a seamless fashion. Where other creative changes are jarring, this one feels smooth as silk. The second is discovering that Doreen tucks that giant tail of hers into her skinny jeans. Kraven, of course, is used to wearing his lion vest under civvies, so he gets it. It is just one of those unanswered questions that no one knew needed asking. In the end, we get a team-up of the SG Crew and Kraven the Hunter, a cameo by Howard the Duck, a new villain dressed like a spiffed-up Mum-Ra, and an Escape Room…of Death! We will miss you, Erika, but, if this issue is any indication, Squirrel Girl is in the right hands. Paws. Whatever. We will miss you, Erika Henderson!